Cloudy and windy this evening, becoming partly cloudy after midnight. Low 39F. Winds WNW at 25 to 35 mph. Winds could occasionally gust over 50 mph..
Cloudy and windy this evening, becoming partly cloudy after midnight. Low 39F. Winds WNW at 25 to 35 mph. Winds could occasionally gust over 50 mph. In a stunning first-ever result, the 2019 Mr. Warrior competition at Tehachapi High School produced two top winners. Seniors Mathias Ahlgren, an exchange student from Sweden, and Peyton Stowers of Tehachapi shared the crown and the honors that go along with being Tehachapi High School Mr. Warrior. Snow chilled Tehachapi and surrounding communities. The Tehachapi Valley Arts Association's 14th annual winter photo contest saw many first-time participants this year, with more than 125 entries. Adam Lomonaco knocked down three fourth-quarter three-pointers and fellow senior Jarod Carol paced three Warriors in double figures with 16 points as the senior class shined on Senior Night with a 59-56 win over Ridgeview Friday night. Tehachapi music patrons enjoyed an evening of classical music as performed by students from the Tehachapi Junior Orchestra and the more advanced students who comprise the Tehachapi Strings Orchestra. It's snowing in Tehachapi on Thursday, Dec. 6, 2018. 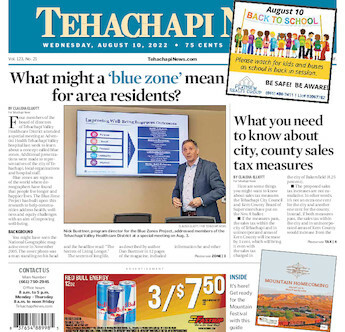 Video provided by the city of Tehachapi.